Originally published in Your Smithfield Magazine – June, 2012. The evening of October 2, 1933, was a glorious autumn night that appeared custom made for romance. The weather was clear and crisp, and millions of stars dazzled the sky. So it was that a young man and his favorite girl parked along a wooded area of Ridge Road near the North Providence line. As the couple sat in the car anticipating what might come next, a man with a pistol suddenly appeared as if out of nowhere. “Stick ‘em up and hand over your dough!” he demanded, as if he were in some low-budget B-rated gangster movie. The couple was in no position to argue, and the young man quickly handed over two dollars, stammering that it was all he had. Ah, the good old days, a time when people slept behind unlocked doors and crime was virtually non-existent. Vintage sepia tone images pasted in yellowing scrapbooks seem to reflect such a simpler time, but did such an era really exist? Consider the case of the wife of Doctor E. L. Bellou of Spragueville, who often helped her husband with his practice by traveling to Centerdale to purchase supplies, and collect past due bills from patients. On the evening of October 30, 1901, she was returning home along the Powder Mill Turnpike, (Today known as Route 44.) when she was accosted in the area of the present-day Greenville Library. Without warning, two rough looking characters emerged from the shadows and brought her horse and buggy to a halt. As one man pointed a gun at the woman, he told the other, “You take care of the horse, I’ll look after her!” He had no sooner uttered these words when Mrs. Bellou produced a pistol of her own and promptly shot him! As the would-be bandit staggered backwards, he fired a shot in return. The bullet passed through the brim of Mrs. Bellou’s hat and out the canvas roof of the buggy leaving two perfectly round holes to denote its path. Before either of the men could recover, the woman put the whip to her horse which took off at a full gallop. Smithfield constables were notified, but a search of the area revealed nothing but a trail of blood that led away from Greenville. Town officials, outraged at the brazen robbery attempt, and subsequent near murder of a well respected woman, posted a $300 reward for the capture and conviction of the men responsible. Whether or not they were ever apprehended is unclear. Although there is no definitive proof that the same two men were responsible, a similar attempted robbery occurred a few days later on a highway in West Greenwich. In that incident, one of the men was disguised as a woman! Fortunately it wasn’t all high crimes and misdemeanors that made headlines in those days of yore. 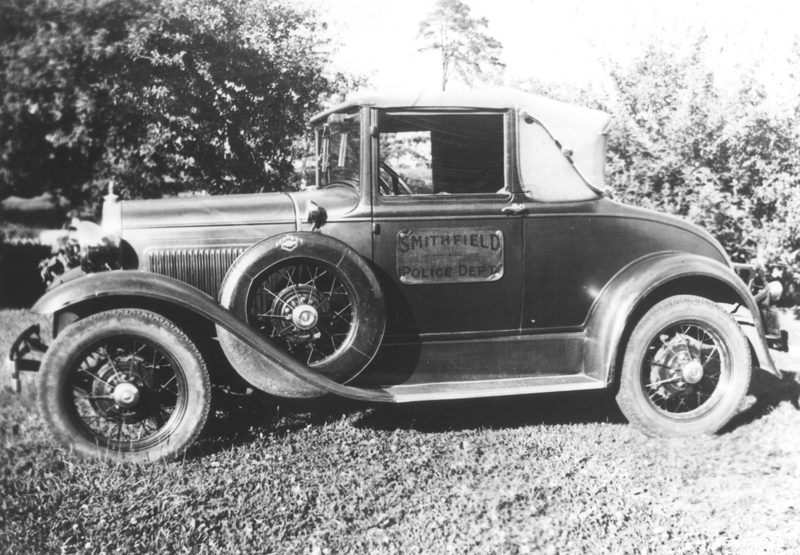 Most of the time Smithfield’s police officers dealt with more benign issues. A case in point occurred one afternoon in the summer of 1937 when then Chief of Police Alfred La Croix encountered two pretty teenaged girls walking along Farnum Pike on their way home from Georgiaville Beach clad only in one-piece bathing suits. After speaking with the girls, the chief drafted a proclamation banning the practice of strolling along public highways in such attire. A newspaper article pertaining to the incident stated that the ban, which also applied to non-Smithfield residents, did not include sun suits or short pants. On the surface one might think the chief was being prudish, for bating suits of the 1930s were quite modest compared to those of today, but it was a time before modern roads and highways, when many “strangers” came to town to swim in local ponds and lakes instead of traveling to the shore like people do today. With this knowledge one can surmise that the chief was doing his due diligence and looking out for the girl’s safety. Apparently traveling peddlers had become a nuisance during the Depression, for in September of 1937 Smithfield’s Town Council adopted an ordinance requiring all peddlers operating in town to have a license. However, certain vendors, such as butchers, fish dealers, and farmers, were exempt. Those arrested for crimes in Smithfield usually spent the night in one of the town’s two “bridewells”; an old English term for jail. One was located in Georgiaville, and the other in Greenville. Prisoners would remain in the bridewell until they were brought before the judge of the Ninth District Court. In the early 1900s court was held in what is today the Veterans of Foreign Wars Post on Farnum Pike. An amusing incident concerning the courtroom wood stove happened on June 24, 1938, when the janitor, following the judge’s orders, started a fire to remove dampness from the building. He apparently did his job a little too well for the resulting heat from the roaring fire, combined with balmy June weather, forced a temporary recess. There was a time when all motor vehicle offenses carried criminal penalties, and were therefore heard by judges of the District Court instead of the traffic tribunals we know today. The Ninth District Court docket for May 26, 1938, shows that a Greenville man was fined twenty dollars for operating his motorcycle at an “estimated” speed of 58 mph on Farnum Pike. How the speed was “estimated” was not stated. Two other men were fined $5 for operating motor vehicles without a license. Police reports of those pre-World War II days are scarce – if they ever existed at all. Many Rhode Island police departments of the era were part-time, and newspapers generally carried more information about an incident than day-sheet entries in a police blotter. A case in point is the Pawtucket man who was slightly injured on April 23, 1939, when his hastily repaired two-seater airplane crashed at the Smithfield Airport, located where Bryant University stands today. The crash was blamed on a “bad welding job” and the mechanic responsible was promptly fired. The plane was owned by the Smithfield Airport Club, an organization consisting of young men interested in aviation. In the later twentieth century is the story of what was perhaps Smithfield’s best kept open secret; a “safe house” where notorious criminals were kept in protective custody until they could testify in federal court. In the spring of 1971, a chain link fence was erected around a former mill owner’s home in Stillwater, and soon afterward men with automatic weapons were seen patrolling the grounds. Those men were United States Marshals attached to the Witness Protection Program however none would admit it at the time. Town officials who made inquiries and attempted to access the property were rebuffed and turned away. The Marshals put forth a cover story that the U.S. Department of Interior was developing anti-pollution equipment at the site, but nobody believed it. Before long it was common knowledge what was going on at the property although government officials would neither confirm nor deny the “rumors”. One might be surprised to learn that many famous, and not so famous, underworld figures were sheltered there, ranging from corrupt cops and politicians to international drug dealers and stone-cold killers. When a local news station began filming activity at the house the Marshal’s abandoned the site for one more secretive. Today the former “safe house” is a private residence. On April 27, 1977, the sleepy village of Stillwater once again made the news when three men used dynamite to blow up the Capron Dam at the bottom of Capron Road. Millions of gallons of water gushed forth before the dam was repaired. The men were part of a construction crew digging a trench in the area that kept filling with water seeping from the pond. Rather than employ pumps, they chose to empty the pond. More than just old newspaper accounts survive to give a glimpse of those long ago days. In September of 2009, Smithfield’s then Deputy Chief of Police, Richard P. St. Sauveur, discovered an old iron key that once locked the cell of the Georgiaville Bridewell, and donated it to the Historical Society of Smithfield. The artifact is presently on display at the Smith-Appleby House Museum.